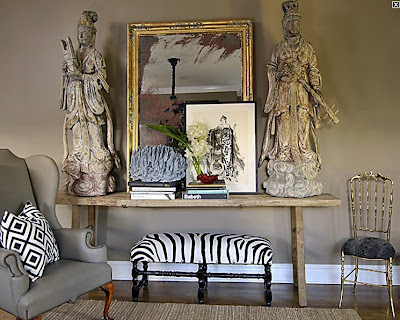 Despite the fact that console tables often reside in hallways and living rooms, they are most commonly found in entryways and foyers. They always seem to catch my eye because I feel that they offer a glimpse of what is to come in the rest of the house. 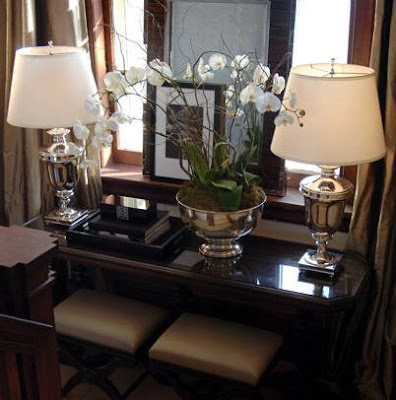 So often, you can tell a great deal about the homeowner's taste and interests by the objects found on his or her console table. It seems that composing the perfect arrangement (I loathe the word tablescape. It is so Sandra Lee.) is more of an art than a science. Everyone has a different approach. Most of the time, you will find a pair of lamps on the table, though some people prefer a single lamp. 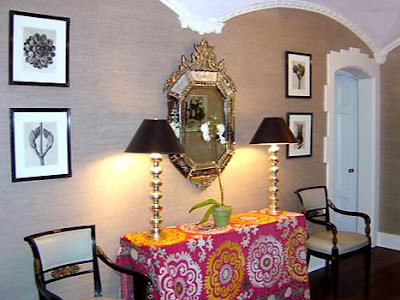 What if you have sconces flanking the table? I have sconces and a mirror above mine and think that adding lamps would be overkill, but I am not a designer so I digress. Quite often, designers will add a variety of heights and textures to make for an interesting composition. Some will add framed prints or photographs, while others choose stacks of books, found objects, artifacts, and beautiful flower arrangements which extend a warm welcome to visitors. I'm not sure that there is a set formula for creating the perfect table for your entryway. In my opinion, it's about not having everything match (think variety in terms of picture frames, candlesticks, etc) and including interesting objects and a personal touch. If you don't have a ton of money to spend, it may seem daunting to try to emulate any of the tables below, but one can always substitute creativity for cash. Adding books, framed prints, unique objects found on vacation, items from antique markets and fresh flowers are generally inexpensive and add a lot of character. 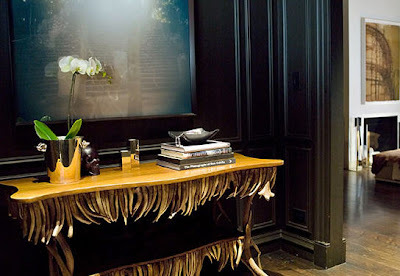 Todd Romano's ultra chic table is one of my absolute favorites. There are so many great details. The gorgeous table, the beautiful patina on the chair, interesting objects like a large egg and a bird, and a burst of color from the fuchsia peony. 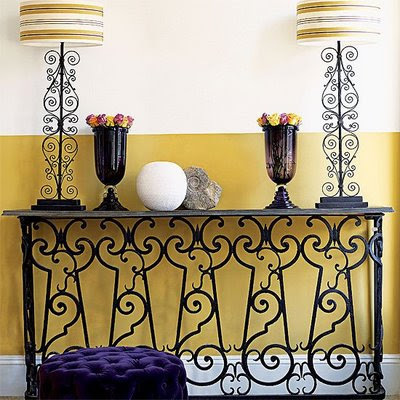 Ron Marvin's stylish table features color, items in varying heights, and a pair of Hollywood Regency style lamps that he picked up in a flea market. Ron is a self-proclaimed lamp-tramp. His 250 square foot apartment is home to 11 chic lamps. The colors and the wrought iron in this image are all very romantic. It makes me think of a stylish villa near the Mediterranean. 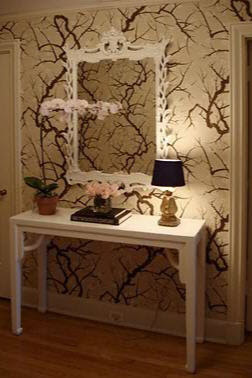 I love the mirror and the wallpaper. Anne Coyle incorporates a suzani into this arrangement, while keeping the number of objects on the table to a minimum so as not to detract from the beauty of the suzani or the venetian mirror. 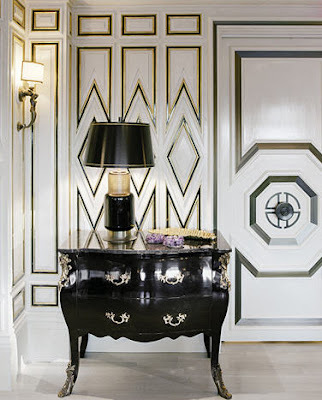 I am so in love with the wallpaper and mouldings in this room. Just look at the arches and the door frame! 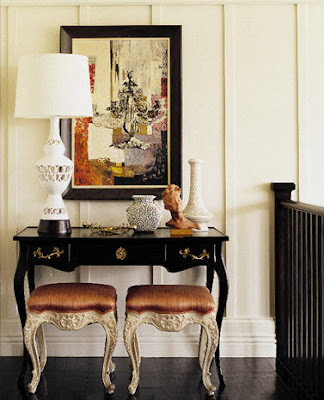 I love the contrast of the dark paneling in the hallway and the stark white living room. 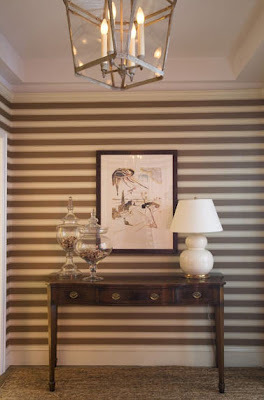 This striped foyer was a favorite in my post on Amanda Nisbet. This belongs to Jennifer Dyer, Preston Lee's partner. She plays with scale so masterfully. This gorgeous arrangement belongs to the incredibly talented, Katie of the blog Katiedid. 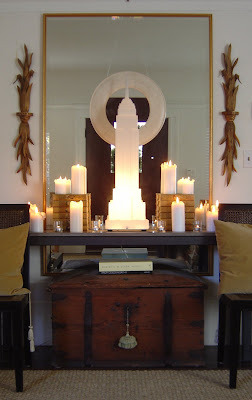 I love her use of symmetry, the soothing monochromatic palette, and her beautiful Empire State Building Lamp. Katie frequently changes her tablescapes. This one is from the summer. Aren't the branches lovely? I am so in love with Sally Wheat's home. It is even more beautiful in person, if you can believe it. She has such a great eye! 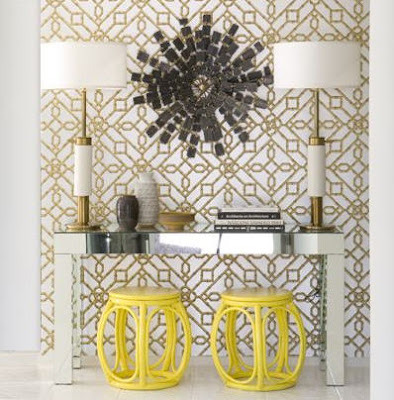 Kelly Wearstler used a bombay chest and minimal accessories in this foyer. If the tablescape were too busy it would compete with the intricate detail of the wall. 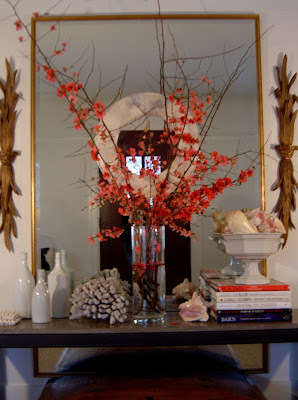 An elegant arrangement by David Jimenez, one of my absolute favorite designers. All of the elements work together so beautifully. Plus, it looks like such a fun home! Cocktail, anyone? I love all of the patterns along with the bursts of yellow and gorgeous flower arrangements implemented by Ryan Brown in this home. I know that some people think it is a no-no to hang a mirror horizontally over a table, but I think this looks fantastic. 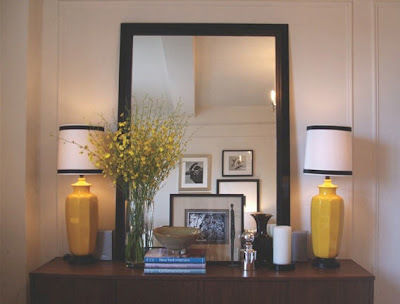 As a matter of fact, the mirror over my console table is also hung horizontally. I think it works better that way with my sconces. loving these! your blog always gives us such great ideas! Beautiful post, and thank you for calling out the word "tablescapes" as Sandra Lee. SO true (and funny). I love the haphazard look... like those things just happened to land on the table in such a perfect arrangement... still trying to master that one myself! I'm going to go relook at my front table right now! Agreed. 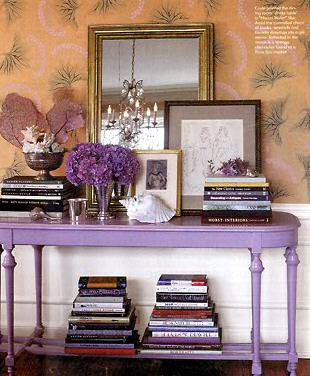 I totally can read a house by their entry/console table! What an awesome post!!! Can't pick out my favorite they're all so beautiful. What a stunning round up! These make me so excited to have a home that has an actual entryway...that Sally Wheat shot is my fave. Love the portraits on the wall! Love those yellow lamps in the third picture. I have a huge file called 'entryways', which are really beautiful tablescapes like these. You have some new ones here that I have never seen! So beautiful.